VANCOUVER — Usually when the Clark County Council holds a work session, it’s in a smaller training room next door to the larger hearing room. But Wednesday’s work session on the Freight Rail Dependent Uses overlay proposal was held in the hearing room due to growing public interest. At this meeting the public didn’t have a chance to sound off, but they’ve made their voices heard loud and clear through an online survey held after an open house in August. More than 160 people showed up at that open house at Hockinson High School, with the majority expressing disappointment in the plan. The county also held a meeting with the Brush Prairie Neighborhood Association, and over 600 people followed up by responding to an online survey that closed Sept. 13. 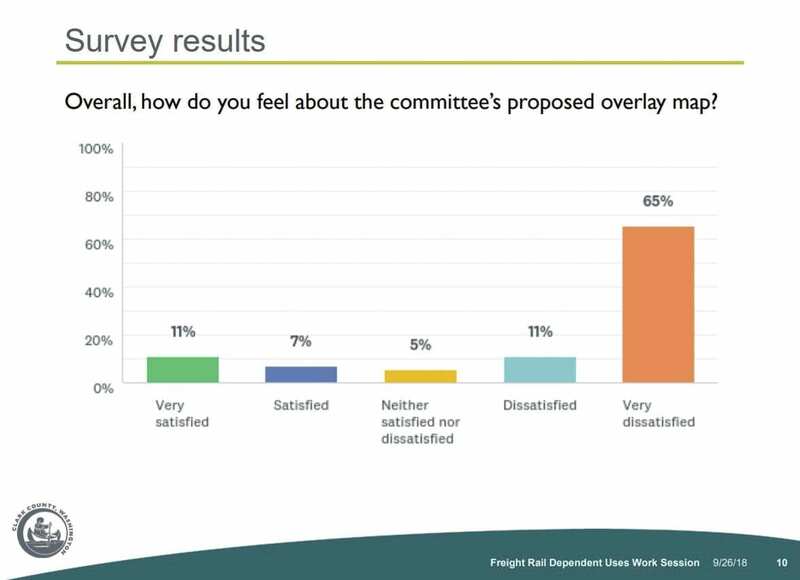 In that survey, only 18 percent said they were “very satisfied” or “satisfied” with the proposed zoning overlay that came out of the Freight Rail Dependent Uses Advisory Committee. Sixty-five, percent said they were “very dissatisfied”, with another 11 percent saying they were “dissatisfied.” A total of 85 percent of respondents with property inside the proposed overlay said they would prefer to be removed from it. At Wednesday’s work session, council members asked staff members if there was a process for land owners to be removed from the FRDU overlay. 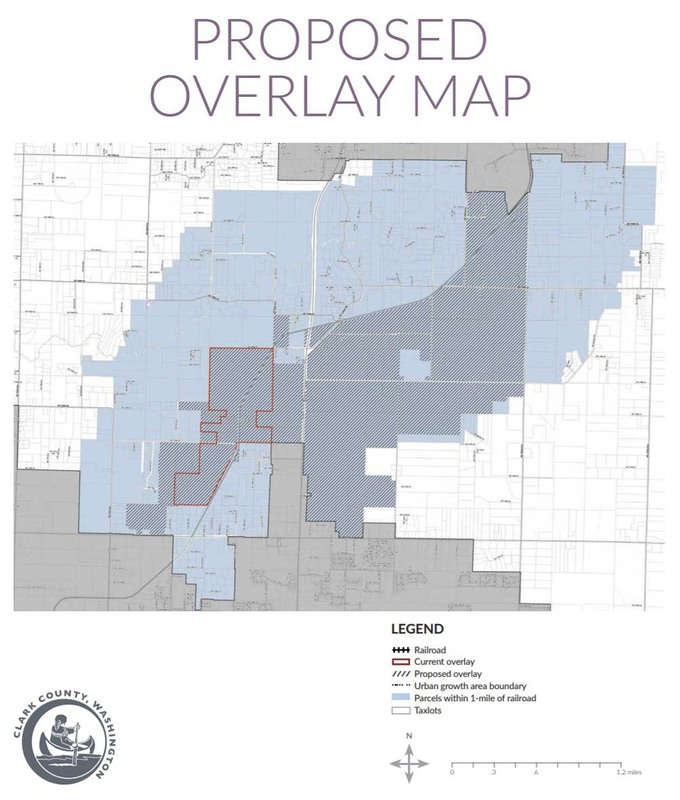 A primary concern the county has been hearing from the public is how much the proposed overlay area has expanded since the initial proposal adopted by the council. That first map included properties within 500 feet of the Chelatchie Prairie line, along a one mile stretch from the Glenwood area up into Brush Prairie. 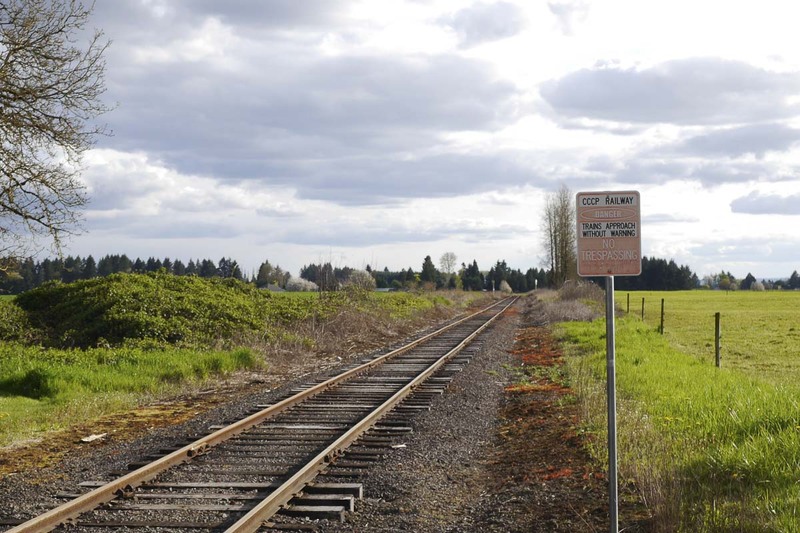 The final map the advisory committee came up with included a one mile definition of “adjacent” to the rail line, in order to include the Rural Industrial Land Bank east of SR-503. While the proposed map has expanded greatly, the committee also set standards that said a development would need to use at least 10 acres, on a minimum lot size of 20 acres, and that buildings couldn’t be over 100 feet in height. Any development also needs to build a six foot dirt berm, topped with evergreen trees in order to provide some barriers for sound and sightline. Aside from the potential loss of agricultural land, and the additional traffic that industrial development could bring to the area, the bulk of the community concerns centered around the types of the businesses and materials that might be allowed. Under the Proposed Uses list assembled by the advisory committee, industries such as asphalt mixing, and petrochemical companies would have been allowed in on a conditional basis. Another potential industry that would be allowed without any conditions is electric power generation, including a nuclear plant. While the council agreed that it’s clear such a development is highly unlikely, given the other regulatory hurdles it would face, councilor Eileen Quiring, who has supported the FRDU overlay, said even the possibility would be a non-starter for her. Council members were told that excluding electrical power from the overlay is something they can do, but that it was allowed on the list of uses because it is currently permitted on nearly any industrially zoned land. Staff presented council with six recommendations, including simply deciding not to do the overlay. The others included reverting to the original overlay map that defined adjacent as 500 feet, some with or without heavy industrial uses, and with or without sewer line. Running sewer lines to the development area would require amending the state’s Growth Management Act, which currently prohibits sewer outside of the urban growth boundary. If the council went with any of those, it is expected the overlay could be fully implemented by next February. Sticking with the recommendation of the FRDU Advisory Committee would require a much longer process to implement, due to the larger overlay area and further environmental studies that would need to be done. Staff estimated it could be 2020 before the advisory committee’s recommended zoning overlay could be put into effect. The council will return for a follow-up deliberation work session next Wednesday, and could select one of the options to move forward with, or give staff another direction. The goal would be to have the Planning Commission hear the proposal by the end of this year, with the council taking it on in January. Whichever path they decide to take, the council will likely look much different when the final discussions are going on. If Eric Holt manages to win the county chair position, he has already said he will vote against the FRDU overlay plan.